1. Tambour beading is a type of beaded embroidery often seen on couture gowns. If you have never heard of it, check out this blog post showing examples and finished works. It even has a link to a YouTube video showing how it's done and a class in the technique. 2. Glass knitting by Carol Milne. A friend sent me a link to these artworks made of cast glass, reminding me that I saw them in person last year in NYC. In real life, they look like resin sculptures, but are in fact cast glass. They are really beautifully made and have great color. In person they almost seem to glow. You can find her work online, but if you do get a chance to see it in person, it is even more beautiful. 3. 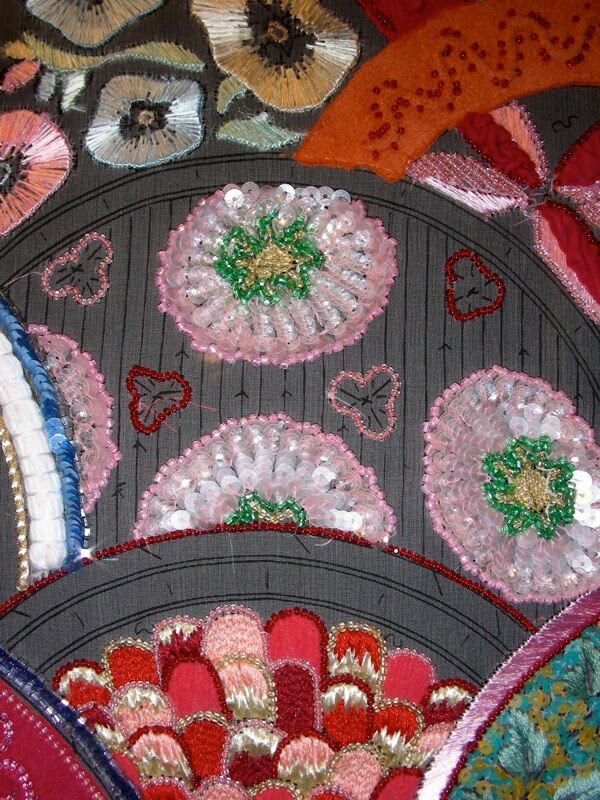 Monikah Schuschu is a fiber artist in the more traditional sense. her work uses embroidery and crochet to create complex shapes in lace, sometimes with found objects. Her stitching is incredibly organic in shape and texture and looks like the work of nature, not a human hand. She has many more images on her website.